War has changed...note ...but in the end, war never changes. "We knew the world would not be the same. Few people laughed, few people cried, most people were silent. I remembered the line from the Hindu scripture, the Bhagavad Gita. Vishnu is trying to persuade the Prince that he should do his duty and to impress him takes on his multi-armed form and says, "Now I am become Death, the destroyer of worlds." I suppose we all thought that, one way or another." Things that make cities go boom. 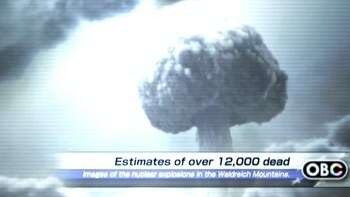 The use of atomic bombs in fiction started as soon as the possibilities of splitting the atom became known - H. G. Wells first used the term in fiction in 1914, three decades before their invention.note Wells also predicted the submarine-launched ballistic missile and its strategic implications in 1933's The Shape of Things to Come. When the atomic bombings of Hiroshima and Nagasaki showed just what effect they had, they became an integral part of culture. for somebody else witnessing from outside the fireball and blast radius. You, on the other hand, will be vaporized faster than any neural signals could travel to the brain, let alone be processed into actual perception, and will cease to exist without ever knowing that anything happened at all. And that's not even mentioning radioactive fallout, which can spread for many, many miles following the explosion, and can kill many more people through radiation poisoning. Just remember the First Rule of Nuclear Weapons: "What is the one and only way you can avoid being killed by a nuclear explosion? Don't be there when it goes off." This is about them in both fact and in fiction. All aircraft, missiles etc. with nuclear capability, or a nuclear capable variant. Any planned nuclear-capable platform that did not enter service or entered service in a non-nuclear form only if it was obviously intended for a nuclear capability. Therefore the Seawolf-class attack sub is included in Superior Firepower as it was a Cold War design intended for nuclear-use. The Virginia design occurred afterwards, so isn't. The same applies with Russian carriers- Admiral Kuznetsov is included, the new planned carriers are not. If a ship was laid down, it's included. Confirmed future nuclear weapons projects. All ASROC-capable warships developed before 1989. Platforms that did not enter service in a nuclear role are listed in [Square brackets].